This is the eigth newsletter send by the Tolkien Library. It summarizes the events of what has happened on the site in the last few months and brings the latest news. These letters will be sent once in a while and will feature all changes and updates to the site. The last month TolkienLibrary.com has taken some big steps forward. It has been totally re-designed and a lot of new functionalities have been added. 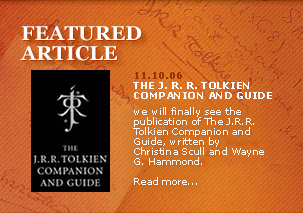 We have now an integrated newsmodule, bringing all the latest Tolkien news together. You can also use your favorite RSS reader to get the latest TolkienLibrary.com headlines and all updates, details of changes and additions to the site delivered to your desktop. A lot of new content and pages have been added, and a lot more articles and reviews have been prepared to be released in the coming weeks. Making a website about Tolkien was (and is) a great way to share your passion about Tolkien books; It creates a path to make new friends, meet interesting people on the road. Now it also seems it can put you in the spotlight! When I received the e-mail that I (Pieter Collier from TolkienLibrary.com) had been nominated for an award I was absolutely stunned. The awards would cite the accomplishments of 1 individual in each of 3 categories, Tolkien/Inklings Scholarship, Tolkien/Inklings Fan Appreciation and Tolkien/Inklings Inspired Creativity. Looking at the names of the other nominated Tolkien fans I never suspected to win. Never did I realize that my solo-project was appreciated by so many. Today I'm very proud to announce that I won the Imperishable Flame Award for Tolkien/Inklings Fan Appreciation! The poem "Goblin Feet" was written in a very hard period in Tolkien's life.